Wnt signaling in Development and Disease: Molecular Mechanisms and Biological Functions reviews the core topics in Wnt signaling, from molecular pathway mechanisms to its role in embryogenesis, adult tissue homeostasis, and chronic disease. Written by a team of expert reviewers, the book provides clear and concise coverage of the core foundations of Wnt signaling before advancing to discussion of cutting-edge scientific research. 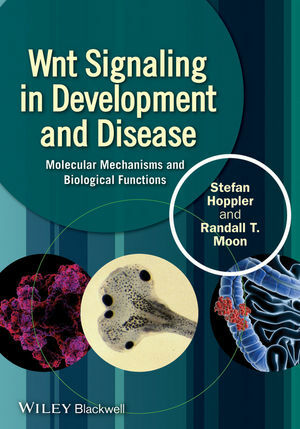 Focused on the biological insights and current scientific questions of Wnt signaling, this book will be a comprehensive and definitive resource for a wide range of researchers and students in cell signaling, cell physiology, developmental biology, and biomedical engineering, as well as anyone interested in learning more about this important and complex protein network. • A definitive source of information on Wnt signaling and its role in development and disease, written by leaders in the field. • Features broad discussion of Wnt signaling biology as well as detailed discussion of the pathway’s role in diseases and potential clinical applications. Stefan P. Hoppler, PhD, is Professor in Developmental Biology at the School of Medical Sciences at the University of Aberdeen. In addition to his teaching duties Prof. Hoppler runs research programs looking at Wnt inhibitors in heart muscle differentiation and tissue-specific regulation of gene expression by Wnt/beta-catenin signalling, and he also serves on the editorial board for the journal Developmental Dynamics. Randall T. Moon, PhD, is Professor of Pharmacology at the University of Washington School of Medicine. His lab focuses on identifying the normal roles of Wnt signaling in embryos and adults and applying that knowledge to develop therapies for acute and chronic medical conditions involving Wnt signaling. Dr. Moon is Founding Director of the University of Washington Institute for Stem Cell and Regenerative Medicine, and a member of the Paul Allen Brain Institute Cell Networks Advisory Council, the HHMI Medical Research Fellows Program panel, and College of CSR Reviewers for NIH.